In the last month or so I’ve been taking a different approach to those beer haters out there. You know the ones; the people who write articles about how craft beer is for stupid dicks with more money than sense and most certainly not for those who view beer as nothing more than an alcohol delivery device. Of course, those very articles attract comments along the same lines ‘‘Yeah, you hipsters with your beer can keep your poofy beer that smells like flowers. I’m a Resch’s man until I die! SILVER BULLET! Who-Hooh!’’. Or words to that effect. There was a time when that sort of thing would really piss me off. I would retweet or share these pieces on Facebook – complete with my own snarky comment – and then I would make sure I hit the ‘‘send’’ button as angrily as I could. But lately, I realised something – it doesn’t matter. 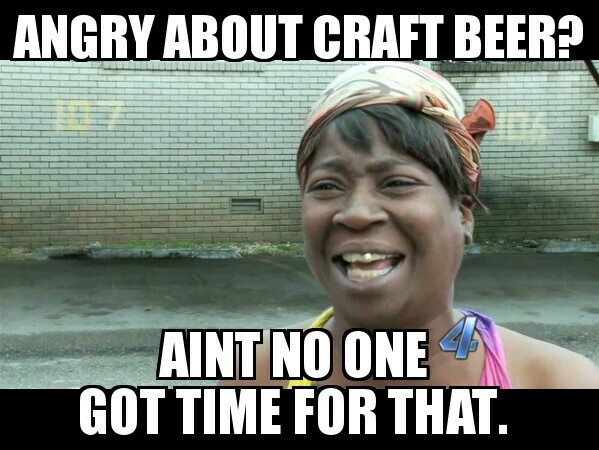 So some people don’t like craft beer – who cares? I kick up a stink about it and, guess what? It adds fuel to the fire of anti-craft beer tirades and keeps them going. So I don’t bother so much with them any more. I don’t always read those articles and I certainly don’t bother posting them on Facebook or linking to them in a blog post. Because it doesn’t matter. I realised something else recently, while reading Luke’s post at Ale of a Time about some of the commenters to a recent anti article. Some of them were just dumb – like the guy complaining that a taste test of canned beer overlooked several breweries that only bottled their beer (d’oh!). But I was suddenly struck by some of the other comments, where people were defending their choice of beer, complaining that it wasn’t scored higher while suggesting that some other beer was rubbish. I realised what we had were people being passionate about the beer they drink. Which really isn’t at all dissimilar to what beer geeks do, is it? Whether we drink craft beer or mainstream beer, we like it and will defend our choice; passionately if required. So we’re all passionate about beer – only the type varies. Which means mainstream drinkers and craft beer drinkers really aren’t that different at all. I think you’re absolutely right: beer passion is beer passion, craft or not. My dad and I have been talking about the idea of beer snobbery a lot lately, and what it actually means to be a beer snob. I consider myself to be a snob in the sense that I am particular, and not interested in beers from ‘macro’ companies. I don’t mean that I look down on people who choose Bud over craft, but the word ‘snob’ may make others believe I do. It is an exciting time for craft beer, though, if we get the opportunity to debate the language that surrounds it!